We are pleased to offer packs of 30 BLANK READY TO ENGRAVE aluminum "business card" sized pieces 85mm x 55mm with 1/8" radius corners and deburred silver edges. These cards are available for sale in Gloss and Matt options, please select your option from the drop down menu. 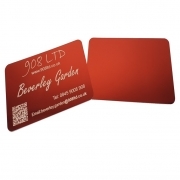 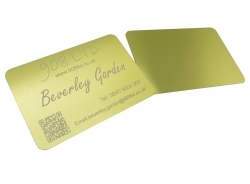 This product has a coloured anodised finish on both sides, which means you can engrave on BOTH sides of this metal. But please be aware that only one side has protective coating. 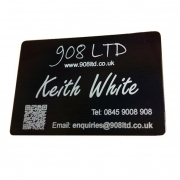 This means that we can only guarantee the finish on this one side. 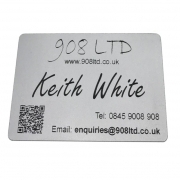 The protective coating should be removed prior to engraving.